For a moment, you may think that documents are just some written words that can be rewritten later easily if lost and that they are still just documents. Well, think one more time. Due to the revolution happened to the computers, handwriting has become non-popular anymore, and the one that is leading the era is the Word documents using Microsoft’s Office Word. The higher popularity of the Word, the higher the importance of what’s written on, and the higher danger of losing it. The last word in the previous paragraph was “Losing it”, and yes, this article is about the loss of word documents. 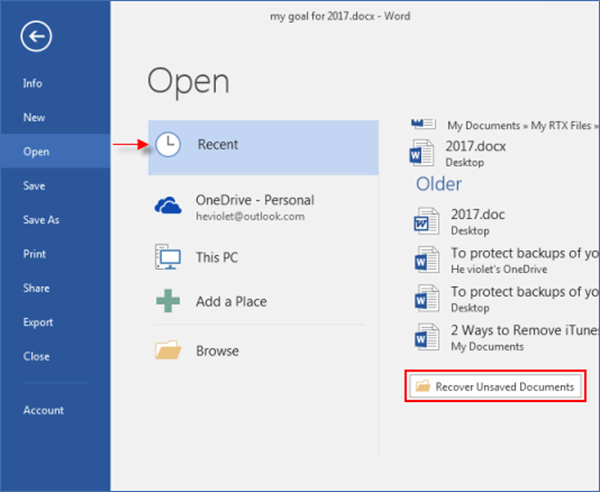 Why do you lose word documents, how to avoid losing them, and how to recover unsaved word documents? All of that will be answered in the following lines, so please scroll down slowly. This is the most common reason among all the other reasons for losing your document files, although it’s better than any other reason, and you will find out why later in this article. This one is common among desktop PCs because they don’t have an internal battery, which we can find in laptops and works as a replacement for the power supply. This may be the second most common reason for losing your word documents, in many cases when you open a huge number of websites along with number of programs, the Microsoft Office Word freezes and stop responding, which in return, leads you to use Task Manager to close the program and relaunch it again, and the result will be losing your documents. The third reason is to shut down your computer without saving your files. This mostly happens when you receive a call telling you to go out immediately, and you do so without thinking about what you have written. In this case, retrieving unsaved word documents has higher difficulty coefficient. In the previous lines, I explained the most common reasons for losing word documents. In this one, I will give you some advice in order not to lose them, or avoid losing them as best as you can. Laptops are the most preferred types of computers to write your documents through, as they have their own power supply replacement－the battery, so you can rest assured that you will not lose your files due to electricity cut-off. Microsoft Office Word has a simple interface which makes you think that you can open any number of programs while using it. Well, that’s true, the program is simple and you can use some programs while using it, but some programs known for its RAM and processor consumption would not be appropriate to be used along with any other program even if it’s MS Office Word. Programs like Google Chrome, Mozilla Firefox, Antivirus, or programs like SolidWorks are not preferred to be used while using MS Office Word as they use a great percent of your RAM and CPU which results in MS Office Word freezing. 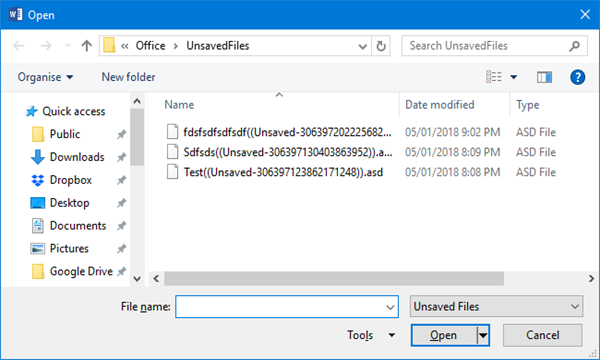 Once you open a new Word document, don’t hesitate saving it in the local drives of your computer, this will save you more time later trying to recover it. Also, after saving it, always use (CTRL+S) keys in order to save every new change in the file. If you do this step, you will be able to recover the most recent version of your file in the worst situations. Yes, I meant it to be capitalized so you don’t scroll down without noticing it. Saving files on the desktop is the most common-wrong act ever, and it puts all your files into risk. Why I’m talking so seriously? OK, listen to this story; Once upon a time, a boy called “Reader” saved all his important files on the desktop, the place in which he installed his windows. One day, and due to wrong steps he has taken, his operation system went down, and he had to reinstall another version of Windows with formatting the previous one due to the low storage. This is a plus advice for you, it’s better to enable AutoRecover function on Microsoft Office Word, and you can modify the period after which the file will be saved automatically. Click on File from the upper-left corner. From the left menu, choose Save. Enable “Save AutoRecover information every x minutes”, and choose the period from the box. Enable “Keep the last AutoSaved version if I close without saving”. 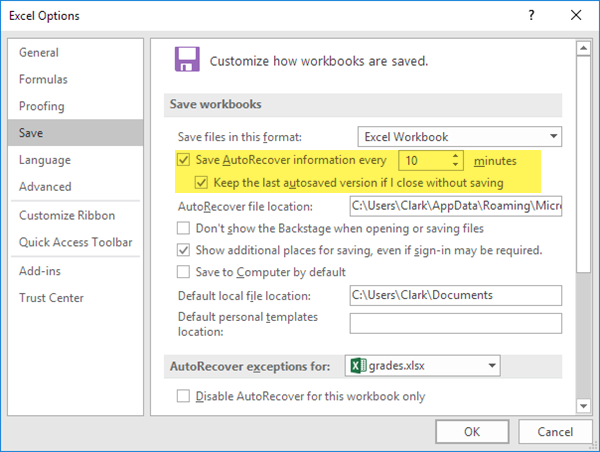 Now you have enabled AutoRecover option; The option which will let you recover your unsaved word documents as you will see in the few next paragraphs. Starting from this paragraph, we will talk about how you can easily recover lost word documents whether they were saved or unsaved. 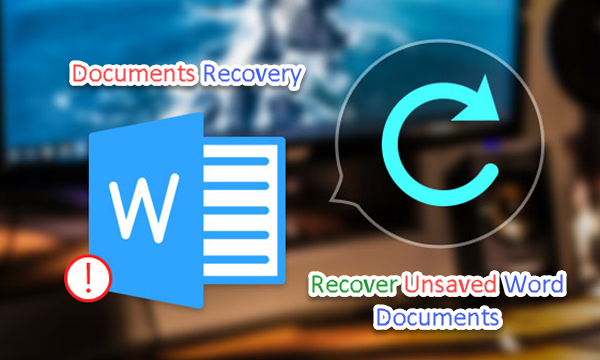 The first method I will explain how to recover lost word document is looking for word backup files. 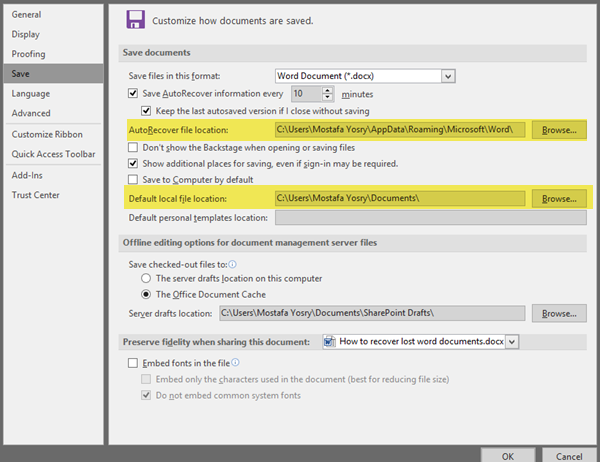 By default, the AutoRecover option is enabled in MS Office 2010 and above. In case it’s enabled, or you’ve followed the advice number five, and came back later to the article after losing one of your documents, this method is for you. Click on Save from the left menu. Under the Save documents section, you will find “AutoRecover file location”, with a path to the backup folder. Copy that path and paste it into the Windows Explorer, and it will take you to the backup folder where you can find all your unsaved files. The second preferred solution to recover lost documents or recover unsaved documents is to use the internal option of the MS Office Word. This option lets you find your unsaved files easily without the need to look for them. Click on File in the upper-left of the screen. 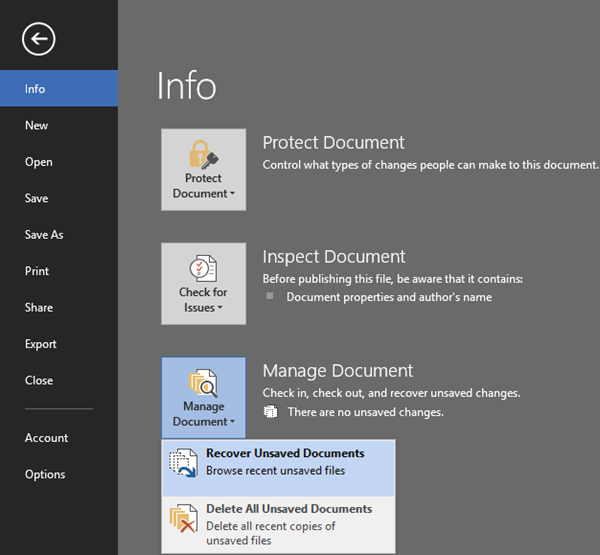 Click on Manage Documents, then select Recover Unsaved Documents. A window will pop-up showing your latest unsaved documents, you can select the file you want to recover and it will open directly on MS Office Word. These files are saved temporarily, as the files will be saved in the Unsaved Documents folder for about 4 days so it may not be so helpful in case you are looking for an old file. This option is also for the files lost for a not-long period, and it works with the deleted documents too. You will find your latest deleted documents in this folder, but make sure to unhide your folders your files by clicking on the View tab, and select Hidden items. Worth to be mentioned, is that word documents files start with (~), so look for the files starting with this symbol in the explorer to find your documents easier. Well, these all methods were explained using Microsoft Office Professional 2016 and Windows 8.1. But did I forget about the older versions of the MS Office Word? Click on MS Office button. Click on Word Options, then click on Save from the left menu. 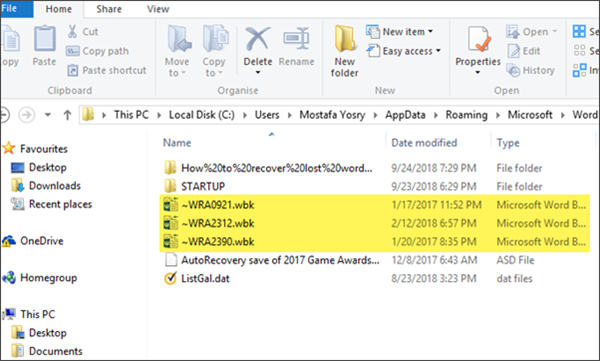 You will find a location beside the AutoRecover file location option, Copy the path and paste it into your windows explorer. Look for the files that have a name ends with (.asd), and then, double-click on it to open your desired file. Click on File in the upper-left corner of the screen, then Open. Scroll down until you find Recover Unsaved Documents option. Look for your lost documents, and then double-click on it to reopen it. To give users the ability to view, edit, and create documents anytime, anywhere, Microsoft Office also offers Office for Android. If you use your mobile phone frequently, you may also encounter important documents that have been accidentally deleted or not saved. What should you do then? Don’t worry! Here is a powerful software that is specially used for Android phone data recovery. It supports multiple data types such as contacts, text messages, call logs, photos, music, videos, documents and more. 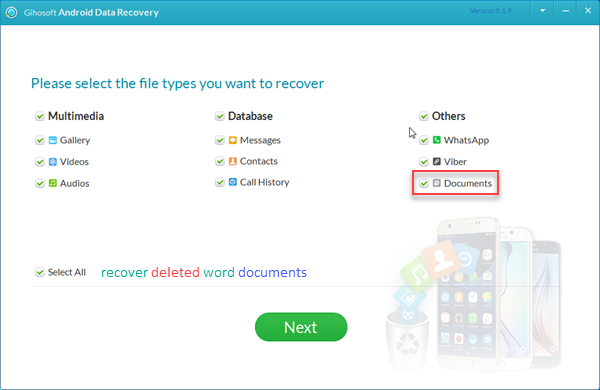 Whether you use Samsung, Huawei, Google Pixel, OnePlus, LG, Motorola or other brands of Android phones, you can use this software to recover deleted or unsaved word documents easily. To get software, you can click the below button to download and install it on your computer. By reaching this line, you now know how to recover unsaved Word documents. I have tried to cover all the possible methods to do that. Now it’s your turn to write what you know and share your experiences in the comments section below.